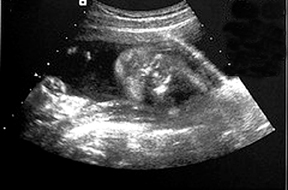 The obstetric ultrasound images of the fetal face demonstrate a single midline orbit (Figure 1). 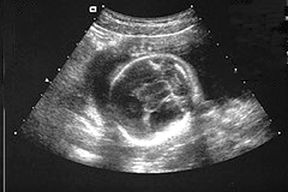 Axial imaging of the fetal brain shows fused thalami (Figure 2). Coronal imaging of the brain (Figure 3) demonstrates a monoventrical with lack of interhemispheric fissure and falx cerebri. At birth a single midline orbit and a probiscus were present. The baby died shortly after birth. An autopsy was not performed and no chromosomal evaluation was undertaken. The holoprosencephalies are a group of disorders that develop as a result of abnormal differentiation and cleavage of the prosencephalon. Holoprosencephalies are commonly divided into three subcategories based on severity: alobar, semilobar, and lobar. In lobar holoprosencephaly, the mildest form, the brain typically has formation of a partial frontal horn and the posterior half of the callosal body as well as a fully formed third ventricle. In the semilobar form, the posterior portions of the brain including the interhemispheric fissure and the falx cerebri are partially formed whereas the anterior brain is fused. Alobar holoprosencephaly is the most severe form and usually leads to stillbirth or death shortly after birth. In alobar holoprosencephaly there is limited formation of the anterior portion of the brain. The brain of affected patients commonly lacks a falx cerebri, an interhemispheric fissure and a corpus callosum. In addition, there is absence of the third ventricle as the thalami are fused. The cerebrum is only partially formed and is located in the rostral calavarium. A large dorsal cyst occupies the majority of the clavarium. In most cases of alobar holoprosencephaly, patients have obvious midline facial deformities, such as midfacial clefts, a primitive nasal structure and hypotelorism. In the most extreme forms there is fusion of the globes and orbits, which results in cyclopia. Because of the severe malformations present in alobar holoprosencepahly, it is diagnosed by ultrasound more commonly than the other forms. The etiology of the holoprosencephalies is heterogeneous and has been attributed to both environmental and genetic causes. Veratrum alkaloids and distal inhibitors of cholesterol biosynthesis are teratogens that have been associated with holoprosencephaly. The malformation is frequently due to microdeletions or duplications within the genes responsible for forebrain development. Holoprosencephaly has also been associated with triploidy, trisomy 13, trisomy 18, and a number of other syndromes. The prevalence of holoprosencephaly varies considerably depending on the point during gestation at which it is measured. In a large epidemiologic study, Croen et al found the prevalence of holoprosencephaly to be 1.2 per 10,000 live births and fetal deaths. This figure was supported by a recent study by Bullen et al that found the total prevalence, including terminations, was 1.2 cases/10,000 registered births. This same study found the birth prevalence, which included stillbirths and live births > 24 weeks, to be 0.49 cases/10,000 births. Holoprosencephaly is a rare congenital anomaly that is characterized by lack of cleavage of the prosencephalon. Holoprosencephaly can frequently be diagnosed via screening ultrasound at 20 weeks gestation. 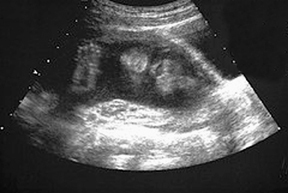 The diagnosis should be considered in fetuses and infants who have midline abnormalities. Barkovich AJ., ed. Pediatric Neuroimaging. 2nd Edition. Philadelphia, PA. Lippincott-Raven; 1996:230-236.
Cooper MK, Porter JA, Young KE, Beachy PA. Teratogen-mediated inhibition of target tissue response to Shh signaling. Science. 1998;280(5369):1603-1607. Chen CP, Shih JC, Hsu CY, et al. Prenatal three-dimensional/four-dimensional sonographic demonstration of facial dysmorphisms associated with holoprosencephaly. J Clin Ultrasound. 2005;33:312-318. Croen LA, Shaw GM, Lammer EJ. Holoprosencephaly: Epidemiologic and clinical characteristics of a California population. Am J Med Genet. 1996;64:465-472. Bullen PJ, Rankin JM, Robson SC. Investigation of the epidemiology and prenatal diagnosis of holoprosencephaly in the north of England. Am J Obstet Gynecol. 2001;184:1256-1262. Alobar holoprosencephaly with cyclopia. Appl Radiol.